The Christmas after Zach turned two Santa brought him a train table complete with huge rail lines inter crossing and weaving all over a table. You can see his excitement in this video. However, that excitement quickly waned. And I mean within 1 month or so. Sure, every time a friend would come over he would get all excited again, but he really never took to the whole driving the train on the track thing, had zero patience for putting the rails together and mainly wanted to smash it apart. 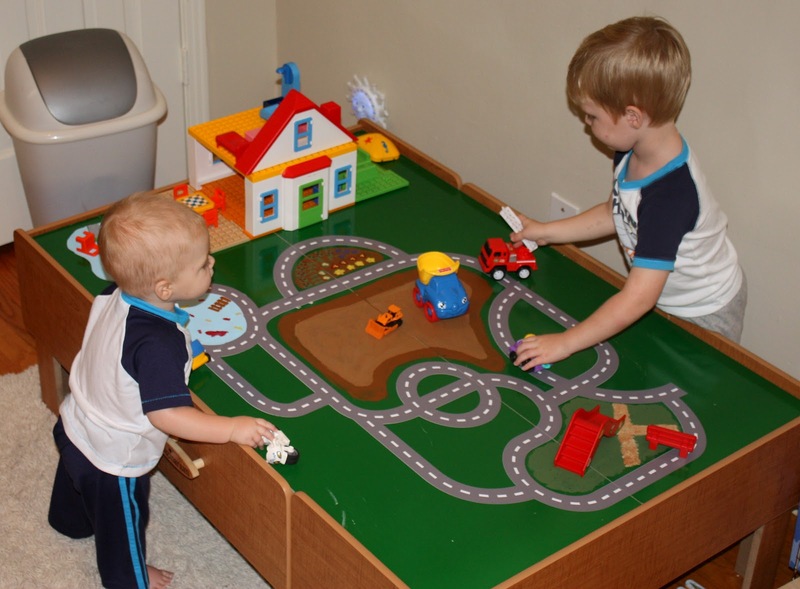 I finally got fed up and took all the pieces off the table last Christmas replacing it with his PlayMobil house that his Auntie Tami and Uncle Dave got him and some random Little People accessories. 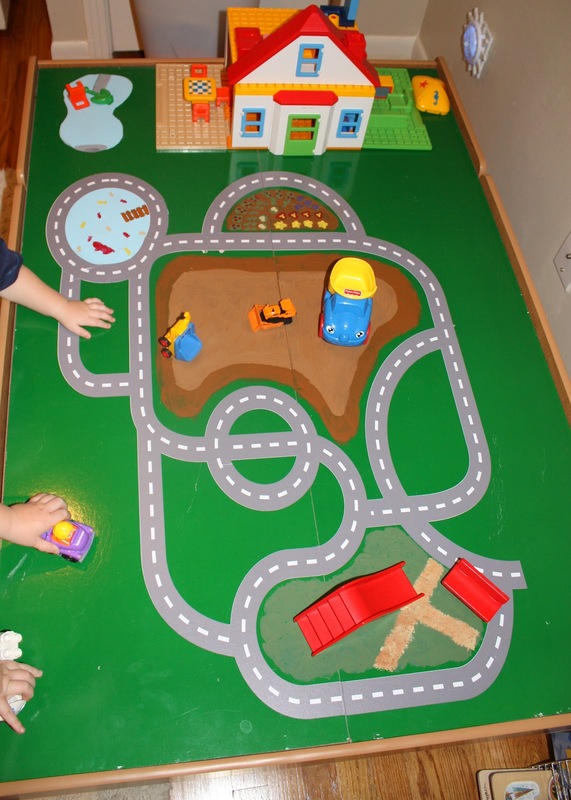 He liked it better but the table would still become a junk station for everything in his room. Cut to this year when James has really started it like cars and trucks. He makes the “uhhhhh-huuuhhh” driving sound and drives them (usually on himself) but often on the floor. 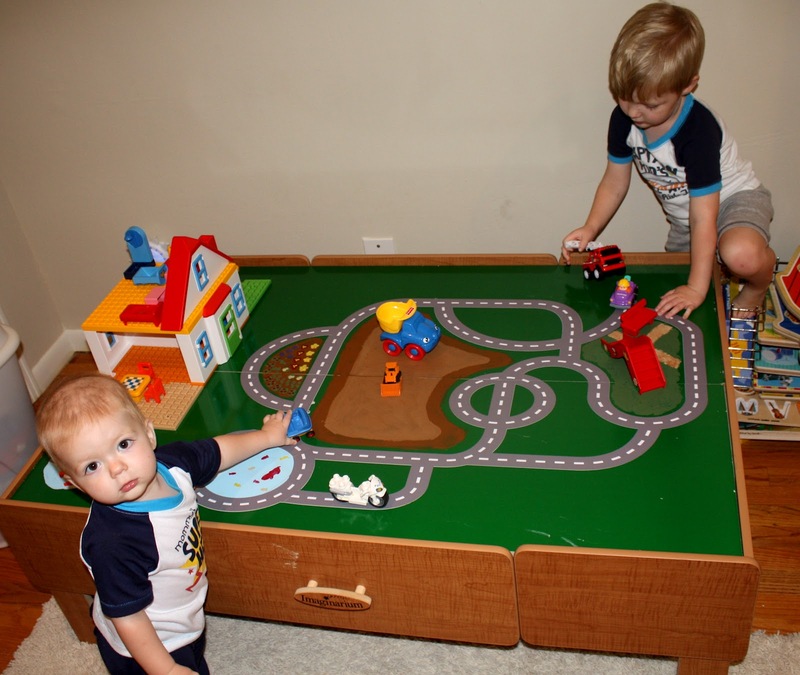 I decided to flip the train table top over and make a road so the boys could drive their cars on it. I wanted to paint a track on there then, while searching on Pinterest, I noticed they had track tape and wondered, if they had track tape, could I just find a track already created for me? Thanks to Etsy (my second best friend behind Pinterest) sure enough people make vinyl tracks. Technically they are for wall decorations, but I emailed the designer and asked her to remove the trucks and scale it for my table. I could not love it more and the second I popped it on the table both boys started driving all over it. Finally! A use for that table. It only took 2 years.